When it comes to your safety glasses, you cannot mess around. You have to make sure that you protect your eyes at all times, regardless of the situations you are in or the environment in which you work. Whether you plan to use these glasses in professional or personal situations, the same basic truth remains significant. It only rises in significance depending on whether or not you need a prescription. Once you do, clarity becomes as important as durability. Simply put, especially working in detail-oriented situations requires you to see everything just as clearly as you would with regular glasses, but with added protection for your eyes. That, in turn, leads to a crucial question: which material is best for your prescription safety lenses? As you might imagine, the answer depends on the situation you’re facing. Polycarbonate has become increasingly popular, and does have a number of valuable features for safety applications. To help you better choose your eyewear, consider these advantages and disadvantages of polycarbonate prescription safety lenses. Let’s begin with the positives. As you might imagine, a number of factors should make you at least seriously consider this option for your eyewear. These features tend to revolve around the material itself, which distinguishes itself against regular plastic and other options in a number of ways. It’s a key factor for any pair of safety glasses. You have to make sure that it holds up to sometimes stressful conditions, staying strong over time. That’s especially true considering you probably don’t want to pay for a new pair of glasses every few months. Polycarbonate lenses deliver in full when it comes to durability. This material was initially developed for the aerospace industry, and is still used today for astronaut visors as well as space shuttle windows. In other words, it holds up well to the superior stress of low air pressure. That durability comes in handy during a variety of safety applications. Despite their durability, polycarbonate lenses win in many comparisons to other materials because of their (lack of) thickness. This material is a thermoplastic, which means it is created through a process called injection molding. We won’t go into the details of this process here, but the result is simple: the glasses you get are strong, yet thin. That becomes especially important in safety applications. Especially with a stronger prescription, you won’t have to worry about potentially having thick lenses get in your way of clear vision or your work. The thin nature of polycarbonate safety lenses is a crucial advantage in any situation where this scenario might apply. Polycarbonate is the material used in bulletproof glass today. That alone should give you a good idea of how well it can resist impact. Depending on the ways in which you plan to use or need your safety glasses, this advantage is more than just convenient. It can become absolutely crucial. Imagine, for instance, a task in which small pellets of rock fly towards your eyes. Naturally, you want to keep this tender area of your face protected. Polycarbonate ensures that your glasses won’t shatter even with significant impact, helping you keep your eyes protected at all times. Another advantage, and one that contributes to both its durability and impact resistance, is the flexibility of polycarbonate lenses. Simply put, and unlike other materials, you can easily bend them and stretch them without having to worry that they break. That comes in handy, especially in situations where you might need safety eyewear. That flexibility, again, is due to the material itself as well as the process through which the lenses are created. It makes them the ideal solution for many safety applications. You can make sure that the glasses you wear can stand up to stress, even unexpected stress that could otherwise damage your eyes. Finally, don’t underestimate the ability of polycarbonate lenses to block potentially harmful UV light rays. These rays are generally not noticeable, but can lead to significant damage to your eyesight over time. During certain situations, you might be more exposed to them than you would be with regular glasses. Polycarbonate lenses block 100% of these UV light rays. Whether you perform yard work during a hot day or work near bright light sources, you can keep your eyes safe and protected from that light. Again, this makes polycarbonate lenses a perfect match for applications throughout the safety industry. Of course, and unfortunately, polycarbonate lenses are not a magic bullet for your safety eyewear. They come with a number of disadvantages that have to be taken into consideration as well. Only an honest evaluation of both pros and cons help you find a pair of glasses that actually keeps your eyes safe in the situations during which you will use them. For all their durability, flexibility, and impact resistance, polycarbonate scratches easily. In fact, part of the reason that they are so durable is also the reason for this disadvantage. The material is very soft compared to some alternatives, opening itself up to scratches more than plastic or trivex lenses. The glasses won’t shatter. Still, these scratches can hinder your vision in certain situations. Look for polycarbonate lenses that you can enhance with an anti-scratch coating to reduce this disadvantage. Of course, that will increase your budget for safety eyewear – more on that below. First, a note of clarification: because they are thinner, polycarbonate prescription safety lenses are also lighter than regular plastic alternatives, regardless of the strength of prescription. However, the same is not true once you begin to compare them to other advanced materials for your safety eyewear. That’s especially the case with comparing polycarbonate to trivex, a rival to the technology introduced by PPG Industries. These lenses are made using a process that is more similar to regular plastic, and a different base material. That results in lenses that are thicker, but lighter than polycarbonate lenses. Polycarbonate is just as crisp, and in some cases even crisper than regular plastic. However, once again, the same is not necessarily true when comparing it to trivex lenses. Because of the differing manufacturing process, your vision will not be quite as clear for either central or peripheral vision. These difference, of course, are relatively minor. Whether or not they matter depends on the situation in which you plan to use your safety glasses. If the work you perform is extremely detail oriented or relies on clearly seeing your entire surroundings for maximum safety, polycarbonate may not be your ideal choice. In most situations, however, it will do the job. Finally, don’t underestimate the cost of polycarbonate safety lenses. 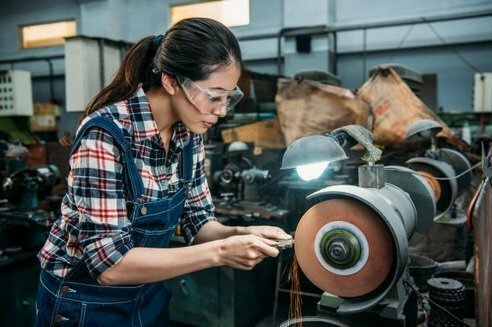 Considering all of the above advantages and disadvantages, this material might just be the single best option for safety glasses around. At the very least, it’s tied with trivex. Of course, that excellence comes with a price difference that is not necessarily minor. More specifically, polycarbonate lenses cost up to twice as much as regular glasses, and often slightly more than trivex lenses. Of course, as the above advantages show, you get what you pay for. But especially if you also have to add anti-scratch coating, that added expense might be too much for your company or personal budget. Honest and thorough evaluation is key in finding the right safety glasses. Without it, you risk ending up with eyewear that might not do its job right and could even damage your eyes. An evaluation should include consideration of all of the above advantages and disadvantages, and how they play into your specific situation and needs. Another step you can take is finding a merchant that offers multiple alternatives. That way, you can make sure that the vendor is not just trying to sell you on one option as the single best for all situations. It reduces the selling incentive for a specific material, and increases vendor credibility. Another crucial point, of course, is looking at the vendors’ returns policy. Especially if you buy online, you have to make sure that the pair of glasses you get matches not just your prescription, but also your safety needs. If it doesn’t, returning your eyewear should be easy and straightforward to help you find the best option for your needs. Finally, look for more information on each material. The internet offers plenty of independent resources to help you make your choice. And of course, talking to your eye doctor helps gather expert opinions on which material helps your eyes stay safe regardless of the situation. Are you looking for safety eyewear that actually and reliably does its job? Polycarbonate may be the right choice for you. Of course, you still have to find a merchant that can help you find those glasses. Contact us to get started, and make the right decision for your safety.